Bulgaria marked Monday for the first time ever the European Day commemorating the victims of the crimes of totalitarianism. The event was held in the park in front of the National Palace of Culture in downtown Sofia, where there is plaque for the victims of the communist regime and was attended by representatives of the City Hall, politicians, other public figures and citizens. 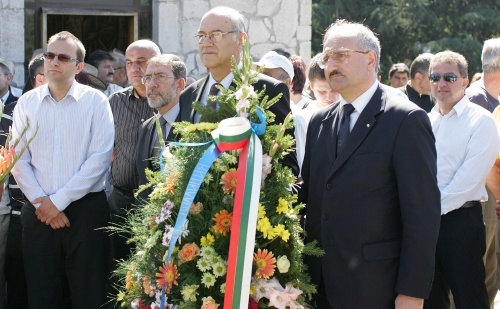 On November 19, 2009, under a proposal of the right-wing Blue Coalition, the Bulgarian Parliament officially declared August 23 a Day of Commemoration of the Victims of the Crimes Committed by Communist and other Totalitarian Regimes. In 2006, the Parliamentary Assembly of the Council of Europe adopted a resolution on the for international condemnation of the crimes of totalitarian regimes, which was later joined by the Council of Ministers at the Council of Europe, the European Parliament, and the Parliamentary Assembly of the Organization for Security and Cooperation in Europe (OSCE). In September 2008, August 23 was declared European Day of Remembrance for Victims of Stalinism and Nazism. Lachezar Toshev, Member of the Parliament from the Blue Coalition and one of its two parties – the Union of Democratic Forces (UDF) delivered the keynote address. He was the MP who submitted the proposal with the Parliament last year. Toshev was adamant the communist regime in Bulgaria is a prime example of totalitarianism and everyone should be aware of the atrocities committed by it and in the name of it while anyone who claims to be a democrat must condemn all forms of totalitarianism. Former Prime Minister, Filip Dimitrov, also delivered a speech and the ceremony concluded with the laying of wreaths and flowers. On August 25, 1939 the Soviet Union and Germany signed the Molotov-Ribbentop-pact which led to the second world war, the killing of millions of people and the Holocaust.